GreenGeeks is a web hosting provider whose goal is to be as environmentally friendly as possible. They offer a variety of shared hosting plans for everyone from beginners to large companies. Their prices are affordable and their plans include plenty of useful features. See our expert GreenGeeks review to decide if it’s the right choice for you. GreenGeeks was founded in 2007 by Trey Gardner. Based in Los Angeles, California, the company now powers over 300,000 websites. The web hosting industry uses a huge amount of energy and has a big environmental impact. GreenGeeks aims to mitigate this by purchasing wind energy credits. They purchase three times the amount of power they use. They’re also an EPA Green Power partner. GreenGeeks has a wide range of hosting plans for customers of every size. They offer basic shared hosting, managed WordPress hosting, reseller hosting, VPS and dedicated server hosting. They also provide a free website migration service so you can easily move from your current hosting company. In our GreenGeeks review, we found that they provide an excellent amount of features for a surprisingly low price. They offer everything you need to build a secure and fast website, whether you’re a blogger, developer, or owner of a growing business. GreenGeeks provides support 24/7 via live chat and email support ticket. They also offer phone support Monday through Friday from 9am to midnight EST, and on Saturday and Sunday from 9am to 8pm EST. 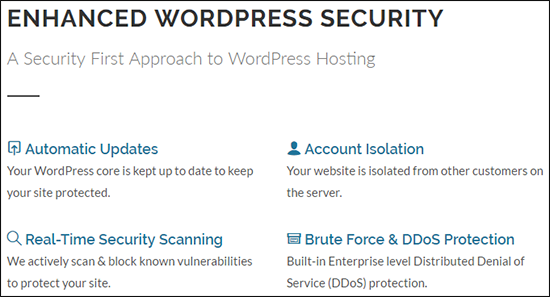 For managed WordPress hosting customers, there are WordPress expert support specialists available to help you set up your site or handle any WordPress-specific issues. Many customer reviews of GreenGeeks rave about their top-notch support. They have a reputation for responding very quickly to inquiries, and providing expert help no matter the issue. GreenGeeks offers a 30 day money back guarantee, no questions asked. This means that within the first 30 days after signing up, you can cancel your account for any reason and get a full refund of your hosting fees. The refund doesn’t include domain registration fees, and you get to keep your domain. GreenGeeks is a popular web hosting company, but it may not be right for everyone. Consider these pros and cons before choosing a plan. Better for the Environment – GreenGeeks is a web hosting company with strong values that cares about the environment. You can help to support renewable energy by hosting with GreenGeeks. Packed With Features – GreenGeeks hosting plans include all the features you need to help you build a fast and secure site. Affordable – GreenGeeks offers very competitive prices for all the features they provide. Highly Rated Support – Customer rave about the top-notch expert support GreenGeeks provides. Phone Support Isn’t 24/7 – Phone support is not provided from midnight to 9am EST. If you have a problem in the early hours of the morning, you must use live chat or email support instead. Setup Fee for Monthly Billing – If you choose the month-to-month billing, there’s a $15 setup fee. The fee is waived if you pay for a year or more. WPBeginner users trust our reviews because we only recommend products and services that we have used ourselves. We sign up for each top WordPress hosting company to thoroughly test their claims by running performance tests. For this review signed up for a hosting account on GreenGeeks and installed WordPress. While using the default theme, we filled the website with dummy data including media and images. This way our test site looked and behaved like an actual average WordPress site. Speed is crucial for the success of any website. That’s why the first test we ran was to measure the website speed using Pingdom. Our test site loaded in less than a second and was faster than 94% of all tested websites. This result is really good. Next, we wanted to see how well our test site on GreenGeeks performs during peak traffic. To measure this we used a tool called Load Impact. We gradually built up to 100 unique visitors at once to see how the server would handle increased requests from multiple connections at once. The green line represents page load time and the blue line represents number of users on the site. As you can see, our test site performed really well through out the test. Next, we wanted to test how our GreenGeeks site responds to requests from different geographic locations. To measure this we used a tool called Bitcatcha. As you can see that the response time was particularly great in the United States. However, it was slower in India and Asia Pacific but still under a second. Is GreenGeeks Right for You? Now that you have read through our entire GreenGeeks review, you might be wondering whether GreenGeeks is the right web host for you. The web hosting industry has a huge impact on the environment. Every web hosting server produces 1390 pounds of CO2 per year. By 2020, it’s estimated that it will surpass the airline history in environmental pollution. You can do your part to support renewable energy by being a GreenGeeks customer. GreenGeeks purchases wind energy credits and is a recognized United States EPA Green Power Partner. They put back into the grid three times the amount of energy they consume, helping to lessen your web hosting’s impact on the environment. Ready to get started with GreenGeeks? Click here to select your GreenGeeks plan today. WPBeginner users get a free new domain and 60% off their web hosting with our GreenGeeks coupon code. I have never had an issue and support is top notch. I have been through 7 hosts in the past 20 years and I have never had a better experience. I cannot even remember having downtime and have never had an issue with quick support. The transfer to Greengeeks from my “old host” was so smooth I jumped with joy! Highly suggested! Never change how you are doing things. Customer Service is just great! They always solve my problems and questions really fast! I’ve used GG for several sites for several years now and I am very happy wit them; Support in particular has always been very helpful – including for problems not of GreenGeeks making. In fact, I think those are the only ones I asked for help with. They have always been responsive, effective, and pleasant to deal with. Just wanted to drop a note to say how pleased I am with your hosting service. The price is right, and I have never had an issue with downtime. Customer Service is always quick when I have a question, and have led me to the correct answer everytime. There are a lot of flaky hosts out there. Thankfully GreenGeeks isn’t one of them. I look forward to a long relationship with them! GreenGeeks is an amazing company to work with as their tech staff are quick to respond and very easily and quickly fix any issues in a prompt, polite and competent manner. I have never had a bad experience in dealing with this company and am happy that they are managing my website and webmail. I would certainly recommend them to others and have done so. I have had up-time problems with my previous host and found Green Geeks. The price is about the same. The transfer from the previous host to Green Geeks was seamless and painless. My websites were up and running immediately. I have been with Green Geeks for over a year. I have not had one down-time so far. I needed help a few times during this period. The support team has been very helpful. They resolved my issues very quickly. I do websites for a several businesses and non-profits. I’ve used a few different hosting companies and usually there is a “gotcha” in their service somewhere. Some didn’t offer many features, some were slow and almost all had lousy customer service. In the couple years I’ve been with Green Geeks I’ve uncovered no such “gotchas”. They offer a great product and a great value. I’ve been particularly impressed with their customer service. With anything but the simplest websites/email there are always issues. The other companies I’ve used have all been stumped by some problem or another. Green Geeks has gotten me though every issue promptly and efficiently. Greengeeks has been excellent, efficient, and good value during the 6 or more years my various sites have been hosted with them. I like them most of all though for their green credentials. It just makes sense! Since we switched to Green Geeks, we have been extremely satisfied with their performance. Unlike our previous host, we have had no problems, their assistance has been top rate, and the have been very easy to work with. We have since added another site with them and are working on still another. GreenGeeks have a great time of devoted professionals, which support, understanding and high quality cooperation is extremely important in this modern type of dynamic living and everyday immense obligations. As I mentioned earlier, I’ve had nothing but success from both the tech side and financial side in terms of support. My only down side is the inability to get server-side tools installed under my domain hierarchy, e.g., Mathematica. I had a project a while back which required it. I no longer have the project, which at conception could have proven reasonably profitable. If you want a hosting service that actually answers the phone, cares about its clients, listens, works with you regardless of your expertise or lack thereof, takes your success as the measure of their success — then you want to be using GreenGeeks. My prior provider switched to a non-English first language call center and bureaucratic work your way up the chain no one cares support. Then I found GreenGeeks it has been a decade now of happiness. They truly care and it shows in each and every interaction. I wish all my vendors could be this good. GreenGeeks is simply the best. I have only used GreenGeeks, but I can’t image any other company that can be as helpful as their staff has always been. They are available, and extremely pleasant in conversation, and I feel a genuine sense of wanting to help. I would recommend them to anyone looking for a Website host. Over the years I’ve utilized a lot of different hosting services. All of the big ones, a couple of the small ones. Many of the small ones got large over time and forgot about their customers. Greengeeks is fantastic and responsive to their customers in a way that no other hosting company is or could be. I’ve been a Green Geeks customer for some years now and I haven’t had any issues. They have great tools for maintaining your sites as well as installing new ones. I use WordPress, which is one of the tools they have already built into the tool set, so it’s easy to add new ones. I also like that they have a chat feature when I have questions. I highly recommend Green Geeks. I’ve been in business since 1986 and have “grown up” in the internet age. I’ve worked with a variety of hosting companies ranging from “consumer” sites to “high-end professional management” sites and Green Geeks is the best. It’s really very simple: You don’t have to worry about anything or do anything difficult. They take care of it for you. And, if you ever have a question – it is answered quickly and professionally. I highly recommend GreenGeeks. I have been with them for quite a while and have never had a bad experience. I have messed things up so bad and when I reach out for help, things are fixed so quickly and I’m always told not to hesitate to reach out. And they are always willing to tell me how I can do things myself in the future if that’s possible. I’ve been using greengeeks for my website for years. Ever since I made the switch to greengeeks, it has been reliable hosting, excellent pricing, and friendly and efficient online chat assistance. Would definitely recommend!! I like doing business with GreenGeeks. Their services/products are excellent. Customer service was superb. They are highly recommended. I’ve been with GreenGeeks for two years now as per the suggestion of my webmaster. Managing the website is much more easier for him than with the previous web hosting provider. For my part, I so appreciate the fact that GreenGeeks stops 99.9% of spam emails. I have set up a forwarding instruction so that all email coming in through my business’ website are redirected to my main email address. Whenever I log into my business domain’s email account I am stunned at the quantity of junk mail that hasn’t been forwarded. I have to find a valid email which was incorrectly stopped. GreenGeeks is saving me so much time and grief by not having to deal with the high volume of spams. I was looking for a hosting company for affordable prices. Big companies lack the care for low talented customers but Greengeeks was awesome. Technical support team was like teaching me everything from the scratch. They literally taught me tricks of web hosting. It has been a very nice experience to learn this job. There are other things like free apps etc. But customer service and technical support team will never disappoint you! I have been using Greengeeks for 5 years. I chose them because of renewable energy use and since then have been thrilled with the reliability and great service. What I really appreciate about GreenGeeks is that the support team always provides (quick) responses to my inquiries. Plus, it’s an eco-friendly company! I would recommend them to anyone looking for a great web hosting company. If you want a simple straight forward web host that is also conscious of the environment… then you are at the right place. Granted I have a very simple webpage(but, with many years in the eCommerce space) but from the customer service I got when getting things set up, I believe they know their stuff!! I’ve had the fortune/misfortune to use many different hosting services over the past decade plus, so I feel that I know quality when I find it. I’ve been with Green Geeks for over 2 years now, and have no plans to leave this organization. They are superb – there down time is essentially non-existent, and I’ve never had such quick, knowledgeable, and clearly-communicating technical assistance. Their cost to value is the best I’ve ever had, and service is excellent. I would not hesitate a second to recommend this company to the rawest neophyte or the most savvy highly experienced. I have been using GreenGeeks for my web hosting needs for many years now and can highly recommend them. Their customer service team has been outstanding! They are very professional and friendly, and have always successfully helped me to resolve any inquiries and get the most out of their web services. Keep up the great work GreenGeeks! I have been very happy with them. When I had problems setting up in the beginning, their tech support was very helpful. I would definitely recommend. It’s been almost 6 years now, and so far so good. They have improved their service and technologies over the time to be always updated. Also their support staff response time is great and they are always willing to help. I’ve been using GreenGeeks for 5 years. I’ve used several hosting services over the last 15 years and GreenGeeks is affordable & stable. The support techs are responsive and knowledgeable. I expect to continue using GreenGeeks as long as I’m providing hosting to my clients. I have had a number of hosted sites over the years, and I have to say that GreenGeeks has ranked #1 with me. They have been exceptional with setting up of sites, and all I can say about their technical service is WOW!!! I had nothing but trouble with a previous host company and when GreenGeeks was recommended, I immediately switched over. I have been impressed ever since. As said in the previous short comment, we come along very well with our website, which we obtained from/via GreenGeeks. At the moment we use only the email part of our account. This runs very well and we see no reason, why we should change anything. Wee hope to reach the state of our start up company soon that we are ready to write a patent. Then we will get engaged to shape also a homepage at our site. But, up to then we rather play close to not existent. We hope that our homepage will rune equally well as our email account. I hope that my German -English will not be a problem. Working with greengeeks as a digital management and production label has given us the ability to support the ongoing work and infrastructure required for us to have and maintain control over the wide range of traffic our platforms see. Growing with such a company of which there’s daily check ins and non stop communications within how to improve our abilities to deliver exceptional services is part of the commitment that makes greengeeks one of our principle supporters of the work we do as black entrepreneurs and engineers figuring out our place in the digital space. Green geek provide a green hosting solution which is in line with the values of our organisation bubblytree. It provides as well an amazing customer service. I love the courteous, quick and readily available customer service response from GreenGeeks whenever I need it in a hurry. Great service guys. Great job. I had hosted with other “Green” companies but got very frustrated with their customer service. greengeeks gives you the level of service that you want. They either help you do it yourself or the help you I doing it for you. I can’t say enough and would definitely recommend them. I highly recommend Greengeeks as a website host. They keep in the background, don’t bug you or solicit, and the one time my website got hacked, they very quickly and professionally handled the situation, and suggested remedies to prevent this from recurring in the future. I was never hacked again. They are very good at what they do. I have been using Green Geeks web hosting to promote charity bike rides. I am self taught on html and css, and I truly love how easy it is to use their services. I have had great support from GreenGeek I also would like to add GreenGeek is the industry’s-leading 24/7/365 Re-seller support is available via chat and email. GreenGeek’s technical support desk is manned around the clock, I have never experienced any type of problems with GreenGeek very friendly and very reliable support Staff the yconduct them selves very Professional don’t keep yo u waiting for I would strongly recommend other’s to come on board with GreenGeek it’s the best move I have made and will keep using their service. I I do not recall where I first heard about greengeeks, but I highly recommend them as a web host especially if you are setting up your first website. They have been very quick to help me troubleshoot any issues, and in no way pushy in trying to sell me further services. Green Greeks customer service is great. They always help me when I call, even with things that aren’t associated with their web hosting like questions about Word Press. They also helped answer questions about backing up my website and changing the name of my website, setting up the website, information for FileZilla like host name/password. Just very helpful to talk to someone as a novice website builder. Everytime I contact Greengeeks I get prompt and helpful customer service. Tech support is rapid, and everyone I’ve dealt with has been very professional every single time. I find the hosting affordable and helps our two Charities to get exposure to the interested parties. I have been a customer for greengeeks for last 8 years. I am hosting our church portal and organisation websites with greengeeks. I have been impressed with their great support and service quality. Considering the quality of the service provided by greengeeks, I will rate them one of best in the business. Thank you greengeeks. I was first introduced to GreenGeeks when I was redesigning a client website hosted on the service. I was so impressed by the quality of the service I received that I moved my own site to GreenGeeks, and am now a GreenGeeks reseller. There is no finer hosting to be found, and their emphasis on environmental responsibility is the icing on the cake. I discovered Green Geeks through my web guy. We are a tiny non profit cat rescue and have an almost zero budget. Green Geeks is the best value for a terrific service with really nice employees. I’m so glad we found them!! Simply the best support I have ever experienced from any company I have ever dealt with. Robert, Alvie, Leo and the whole crew do the BEST job to resolve any issue. Also the product itself, hosting is fast, reliable and super flexible. Yes you can quote me on any of this. I have been with Green Geeks for a long time. I have always found their support very helpful whenever I have needed them. I pay tri-annually and never had any billing issues. I like the no nonsense access to my domains and the scripts are extremely useful and easy to use. I would recommend them to my friends and family. I really appreciate what Green Geek stands for and have always had a great experience with their service for the last 5 years. They are responsive and respectful to my needs. Thanks you geeks that are green. Stable servers, excellent customer service and reliable tech support available 24/7. Almost no downtime in the last 2 years for our website. Recently they even upgraded our site to a better & faster servers for free. I have used Greengeeks for about 10 years as a host for our website. I could not be more pleased with this company. Their customer service has been very helpful when I have needed anything, their platform is easy to use to build a site and I love their commitment to green energy. I would recommend them without hesitation.